Well now there is a brand new purpose for Malta Drive-In grounds when they are not being used by movie goers! It's the new Malta Drive-In Market, a weekly open market that features products from local artisans and craftsmen, as well as fresh produce and food items from local growers & farmers. 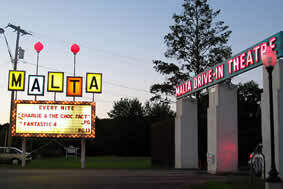 Newly opened (5/22) and barely into their first season, the Malta Drive-In Market is already making a big impact. Their website touts, "Nearly 1000 shoppers visited the Market on Opening Day!" Not too shabby... plus all the locals are buzzing about it! Not only is the market seeking to attract shoppers, but they are also encouraging local artisans, antiques dealers and "anyone wishing to sell used and unique items" to set up shop this season at the Malta Drive-In Market. If you or someone you know fits this bill, learn more about being a vendor. If you are a lover of local farmer's markets and vendor sales, supporting local businesses, and fostering the local economy, make plans to visit the Malta Drive-In Market this Sunday! And if you are a lover of great movies, stick around in Malta (maybe grab a bite to eat) and catch that night's double feature!